White House reaches out to Tehran to help broker 'solution' in Syria, as Obama admin's strategy fails miserably. US and Western diplomats scrambled to cobble together a diplomatic strategy to end the war in Syria on Saturday after the latest humiliating blow to their military plan. Secretary of State John Kerry and his European counterparts reached out to traditional foe Iran on the sidelines of the UN General Assembly in New York. Iran and Russia back Syrian strongman Bashar al-Assad, whom Washington sees as the instigator of a civil war that has left half his country in the hands of the Islamic State group. Unwilling to countenance a peace process that would leave Assad in power after he alienated or killed so many of his people, the US has backed small "moderate" rebel groups. But that strategy appeared in tatters on Saturday after the Pentagon admitted the latest US-trained fighters to cross into Syria had given a quarter of their gear to Al Qaeda. 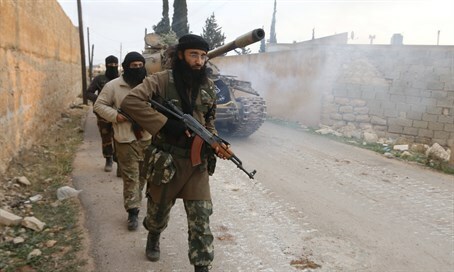 A previous 54-strong group that crossed into northern Syria earlier this year was attacked by Al Qaeda's local franchise, the Al-Nusra Front, and fell apart, leaving only four or five guerrillas active. In contrast to the lackluster US effort to shore up its allies on the ground, Russia and Iran have proven good friends to Assad, who clings to power in Damascus. Iran has dispatched Shiite militia fighters trained and helped by its Revolutionary Guard, and Russia has deployed a powerful military presence to a base on Assad's territory. With the initiative falling away, Kerry and his allies came to New York hoping to persuade Tehran and Moscow to push for a broad political solution to the conflict. Kerry and European diplomatic chief Federica Mogherini met separately with their Iranian counterpart Mohammad Javad Zarif to make the case. "I view this week as a major opportunity for any number of countries to play an important role in trying to resolve some of the very difficult issues of the Middle East," Kerry said Saturday, at a joint appearance with Zarif. "We need to achieve peace and a way forward in Syria, in Yemen, in the region itself and I think there are opportunities this week, through these discussions, to make some progress." According to an EU statement, Zarif told Mogherini that Iran will assist United Nations-led efforts to broker a political compromise that would end the civil war in Syria. But, before his talks with Kerry, he made it clear that Iran's focus in its dialogue with Washington is still on the implementation of the nuclear deal it signed in April with five world powers in exchange for sanctions relief. And Zarif also said he would press for answers about Thursday's stampede at the hajj pilgrimage in Tehran's regional rival Saudi Arabia that left at least 136 Iranians dead and hundreds still missing. "We are going to concentrate in this meeting on the full implementation of the Joint Comprehensive Plan of Action," Zarif said, referring to the deal to limit Iran's nuclear ambitions. "That is the project that we started together and we hope that by its full implementation, its good faith implementation, we can end some of the mistrust that has existed over the past many decades. So that is my priority." Kerry is also due to meet Russian Foreign Minister Sergei Lavrov on Sunday, and President Barack Obama will see President Vladimir Putin during a packed UNGA program. The US diplomatic drive in New York was weakened right out of the gate by the latest news from the battlefield. On Friday, the Pentagon admitted a 70-strong group of rebels that it had trained to fight the Islamic State as part of a $500 million program had surrendered much of its equipment to the Al-Nusra Front. US Central Command, which oversees the fight against ISIS, was already facing an investigation into reports it had manipulated intelligence reports to paint a rosier picture of the campaign.